Mobile development tools are changing rapidly. I had started work on comparing cross-platform mobile tools about a month back. I had initially started with a list of 26 tools. Few got added on the way. However, what is most interesting is that in this short period of time one of the tools (Open Plug) was discontinued. It was a Flash based tool. Since Adobe decided to discontinue Flash for mobile in favor of HTML5 – they really had no choice. Another tool (Pyxis Mobile) has been renamed as (Verivo Software). In this post I give an outline of the Visual Tools where you use a visual editor to build the application. 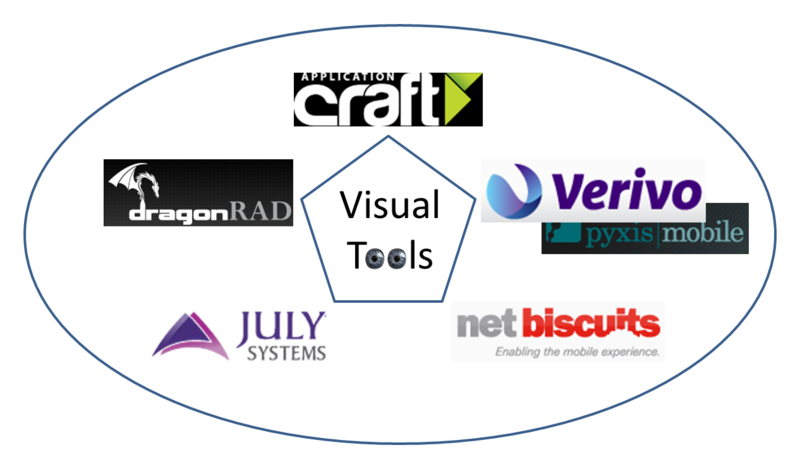 Some of these tools do not give you any access to underlying source code. Here are 5 tools – the ordering is alphabetic. Genesis: Verivo! Was originally known as Pyxis Mobile. Have you seen this Wiki? Here is an interesting wiki – WikiMobidex.org which lists mobile offering from different suppliers. Any supplier can register and add a page for their offering. More than 200 suppliers are listed. Do let me know if there are any errors and omissions in the details I have provided. ← Do People Lie More on Email? In any situation, it is possible to usually head to the customer assistance to air your problems when you have any. check out a Canadian tool padXtec by padworxstudios.com. They built great products quickly with this tool and can deploy native iOS, Android and Windows Mobile with the push of a button. Build it once deploy many times. I’m on my smartphone viewing your blog and these sites. Only a couple made the effort to redirect me to a mobile version. Kony took to long to load and Verivo looked the worst. Seems hypocritical to offer tools that can make liquid and flexible displays but fail to do so on their own homepages. They should be dog fooding. Besides, what’s going to sell me better on a multiplatform development tool than a homepage that IS multiplatform” Which I’m using to mean “screen size agnostic” at the moment. A product that probably should have made this list is NS Basic/App Studio. Now on Version 2.0, it has users in over 80 countries. It works with jQuery Mobile and PhoneGap to create apps which run on iOS, Android, BB and WebOS phones and tablets. The creator of this app, NS BASIC Corporation, has been making development tools for mobile devices since 1993. I think NS-Basic will be a better fit in the hybrid app category – that comparison is in the pipeline. Application Craft is not just for building enterprise apps – it can be used by developers of all skill levels to build a whole range of apps (from quick and dirty apps to very complex apps). Likewise web designers moving into the mobile space can use AC to prototype, design and build. In this sense it is a tool which has relevance for a broad category of developers (and designers). Nevertheless, as you identify, it is highly relevant for corporate / business / enterprise developers who need to get applications built under time pressue and to a high standard. Just to clarify, OpenPlug is not a Flash-based tool. It did use Actionscript as the scripting language, but it was in no way reliant on Flash nor did it provide Flash-based mobile apps. It compiled to native apps, leveraging the native device OS UI libraries.